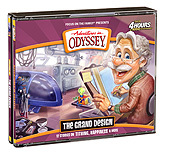 Readers of Focus on the Family’s Thriving Family magazine and fans of Adventures in Odyssey might be pleasantly surprised to discover that a free download of the upcoming episode from Album 56, The Grand Design, is now available for a limited time. Preview The Grand Design with the episode “Happy Hunting” now. You can visit Thriving Family for a free download of “Happy Hunting” along with more free resources. Can’t get enough Odyssey? Visit our product listing for information on the latest release (officially available now in download format). If you purchase the download, you’ll get some bonus features, including a behind the scenes video about the making of “Push the Red Button” and an extra audio track containing an extended rap song from “The Holy Hoopster”. Don’t miss it.